Nutley Windmill standing in the beautiful Ashdown Forest is the last Open Trestle Post Mill in Sussex and one of only 5 left in the country. 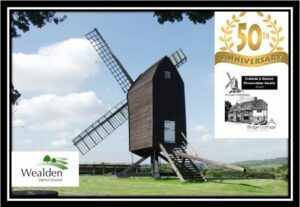 She is the best preserved windmill is Sussex and the only one that is operational. 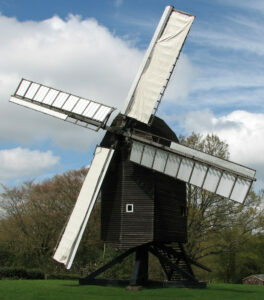 It is a fine example of the oldest design of windmill known in this country since the 12th century. It was built in the time of King Henry VIII in the 16th century and is thought to have been built in Goudhurst, Kent and then moved to the current site in 1830. It was restored to full working order in 1970’s. 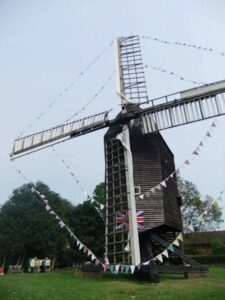 Special birthday parties can be booked at Nutley Windmill. The children can investigate the windmill then grind flour on a set of querns and then cook dough over a camp fire. They can do the exciting things children used to do. A charge of £50 will be made per party. The Preservation Society has a charity shop in High Street, Uckfield (The old Red Cross Charity Shop) and would welcome any donations of saleable items such as clothes, games and unwanted gifts. They also own Bridge Cottage which is a Wealden Hall House located next to the River Uck at the bottom of the High Street – is thought to be the oldest house in Uckfield. Please see the website for details of opening hours.